Carroll Cable, age 84, of Union Mills, passed away on Wednesday, April 26, 2017, at his home. Mr. Cable was born in Graham County, NC to the late William Robert Cable and Minnie Cook Cable. In addition to his parents Mr. Cable was preceded in death by a son, Roger Cable; four brothers, Woodrow Cable, Carl "Bud" Cable, Kermit Cable, and James "Roundy" Cable; one sister, Dica Morgan; and one great-granddaughter, Johanna Raye Carswell. 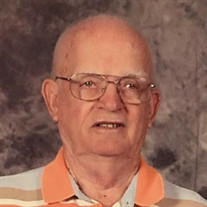 Carroll was a veteran of the United States Army, a long-time supervisor in textile factories, and a member of Gilkey United Methodist Church. In addition, Carroll volunteered at Yokefellow Ministries, was a member of The Gideons International, and was active in the Rutherfordton County Senior Center. Those left to cherish the memory of Mr. Cable include his wife of 61 years, Raye Crowe Cable; two sons, Gary Cable of Jacksonville, Florida and Allen Cable and wife Alisha of Ada, Oklahoma; one daughter Joan Cable Carr and husband Dr. Alan Carr of Lenoir; six grandchildren Nikki Carswell, Rev. Jesse Carr, John Adam Cable, Allison Melton, Aaron Cable, and Adam Wayne Cable; two great-grandchildren, Clayton and Charlee Carswell; and one sister "Tootsie" Taylor of Knoxville, Tennessee. The family will receive friends from 10:00 AM to 11:00 AM, Saturday, April 29, 2017 at McMahan's Funeral Home. The funeral service will be at McMahan's Funeral Home Chapel at 11:00 AM, Saturday, April 29, 2017 with Dr. Alan Carr, Rev. Jesse Carr and Rev. Jack Bridges officiating. Interment will be at Gilkey United Methodist Church Cemetery.